Our cultural community speaks to our sense of identity, expresses our uniqueness and reflects our history. It entertains and delights us, unsettles and challenges us and helps us to think, to heal, to learn and to reflect. Manitoba culture adds to our quality of life and is part of the reason many people make this place their home. You can help create a new culture policy for Manitoba. The policy will clarify what the province is trying to achieve and what principles will guide the changes. It will help coordinate activities within government and with stakeholders to align our efforts and support consistency. And, it will influence and guide us, provide direction, focus our priorities and ensure Manitobans continue to enjoy the social and economic benefits of culture. Diversity, cultural equity and inclusion have received growing attention across all areas of public policy. Diversity enriches our connection to the world. It also means differing needs in our communities, please share your views on how Manitoba's cultural policy can reflect our provinces demographics and diversity. 1. How should the cultural policy reflect the cultural diversity of our province? How can the province ensure the full range of diverse Manitoban voices is expressed, represented and developed in our cultural activities? 2. What barriers currently exist for some Manitobans to fully participate in, or have access to culture and how can the cultural policy help eliminate those barriers? 3. How can a new cultural policy ensure that that support for culture reflects Manitoba's diverse regions, communities and populations? The rise of digital technologies has transformed many aspects of everyday life. Cultural activity grounded in the use of digital technologies has enhanced our ability to both create and consume culture. Please share your views on how Manitoba's cultural policy can adapt to a changing digital landscape. 1. How can Manitoba artists, producers, and cultural entrepreneurs make the most of the opportunities afforded by the new digital environment? 2. What changes need to occur to assist the cultural community in adapting to the rapidly-changing ways that culture is created, distributed and consumed in a digital environment? The culture sector represents a substantial opportunity for economic development in Manitoba. Balancing the need to realize value for money while ensuring the sustainability of our cultural organizations, and capitalizing on the economic potential of this vibrant sector--requires a thoughtful fiscal approach and policy framework. Please share your views on how Manitoba can work to achieve this policy framework. 1. How can the Manitoba government improve the current cultural funding system? 2. How can better partnerships be built between the public sector and other stakeholders, (eg. academic institutions, industry associations, private companies, regional bodies, foundations, etc)? 3. How can cultural funding sources be diversified? Should new tax incentives be considered? Are the current tax measures still appropriate? What other methods can be used to improve non-public sources of revenue to support cultural activity? 4. How can the contribution of the cultural and creative industries to the provincial economy in an environment of fiscal restraint be maximized? What are the most effective means of fostering job creation in the creative industries? 5. What are the biggest internal challenges to sustainability and growth of your cultural enterprise or institution? What are the biggest external challenges to the sustainability and growth of your cultural enterprise or institution? What should the provincial government do to assist in addressing these challenges? Manitoba's professional arts sector includes genres and arts practice in writing, dance, theatre, music, visual and media arts. It is comprised of artists, arts organizations, and collectives in both official languages, and Indigenous nations and communities. Please share your views on how Manitoba can help our professional arts sector thrive. 1. What should be done to ensure that the arts community continues to meet the highest standards of professional arts creation or programming? How can a new cultural policy address the particular demands of marketing the arts to audiences and consumers both within and outside of Manitoba? 2. How can the high degree of connectivity and collaboration among Manitoba's professional artists and arts organizations to best advantage? Where might there be opportunities for increased coordination, consolidation, shared resources or efficiency? 3. How can the cultural community ensure the full range of diverse Manitoban voices is expressed, represented and developed in the professional arts (including women, ethno-cultural minorities, people with disabilities, urban/rural and Indigenous peoples)? 4. What are the training and professional development challenges for Manitoba artists? 5. Is the operating model of the Manitoba Arts Council still appropriate? How can it be modernized or improved? Community Arts activities are integrated into the lives of everyday Manitobans, offering inclusive and accessible opportunities to participate in arts and culture. Community arts also include festivals and events, which provide opportunities for the public to experience the work of highly accomplished artists, and drive local tourism and economic activity. Please share your views on how Manitobans can support Community Arts in our province. 1. What can be done to ensure that all Manitobans have the opportunity to experience or participate in the community arts (including women, ethno-cultural minorities, people with disabilities, urban/rural and Indigenous peoples)? 2. Why are the community arts important to Manitobans and their communities? What priority should community arts programming have in a new Manitoba cultural policy? 3. What barriers do Manitobans face to accessing opportunities to experience community arts activities (performances, participation, arts education, etc)? 4. How can government assist with the development of community arts? What types of funding best answer the needs of community arts practitioners? What types of assessment (e.g. peer review, formula-based)? The creative industries of Manitoba are those directly involved in the commercialization of cultural products and services. The sector is comprised of businesses and individuals who earn income through the creation, production, marketing, sale and distribution of cultural products and services. 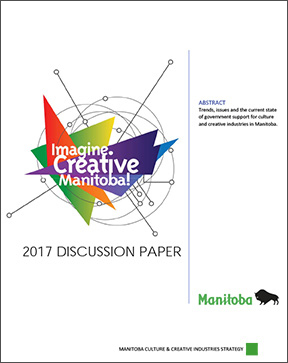 Please share your views on Manitoba's creative industry sector. 1. What are the barriers to Manitoban producers harnessing the full potential of their intellectual property? What can be done to alleviate or eliminate these barriers? 2. What can be done to maximize the creation of Manitoba content? What can be done to increase consumer access to Manitoban content? 3. How can a new cultural policy ensure the full range of diverse Manitoban voices and stories are expressed, represented and developed in the creative industries (including those of women, ethno-cultural minorities, people with disabilities, urban/rural and Indigenous peoples)? 4. Is the operating model of our creative industries development organization, Manitoba Film and Music, still appropriate? How can it be modernized or improved? Manitoba's heritage sector refers to tangible or intangible resources that an individual, organization, community or government determines to have value, as an inheritance from the past and a legacy for current and future generations. Please share your views on how Manitoba can preserve, protect and promote our heritage. 1. What should be reflected in the province's priorities for heritage preservation? 2. What changes should be undertaken to ensure heritage conservation is always considered in the implementation of broader government initiatives to enhance community and economic well-being? 3. Could a partnership between the community and government benefit the preservation of heritage resources in Manitoba? Do you believe Manitobans would participate more fully in the preservation of our heritage assets if there were expanded opportunities to sponsor, partner, or donate? Are our heritage venues being fully utilized by the public, or are there opportunities being missed to engage the public and provide Manitobans with the opportunity to partner with heritage venues? 4. What are the major barriers to heritage preservation? How can they be mitigated or eliminated? Archives are generally seen as repositories that house records used by communities to document their history. Archives are in fact much more than that. Archives are increasingly becoming places where hobbyists and members of the public go to research personal interests, such as family trees, local history, or events that occurred in particular years. Please share your views on Manitoba's Archive sector. 1. How can archivists in Manitoba best meet the challenges/expectations posed by the Internet age while still maintaining public access to the majority of their materials that are not digitized? 2. What can be done to ensure the survival of a diverse archival record that reflects ethno-cultural minorities, Indigenous peoples and others who are generally or historically under-represented? 3. Should the government look at developing, with the Association for Manitoba Archives, the Provincial Archives, universities and other interested partners, including the private sector, the creation of an Archival Hub for the province, where information can be exchanged, local archival documents retained, and the promotion of the Hub as the centre of expertise and a focal point for the province and the country? There are 56 public library systems in Manitoba with 120 branch operations. This includes 31 independent municipal libraries, 21 regional libraries, and 4 pilot library services in partnership with Indigenous communities. Please share your views on how Manitoba's cultural policy can meet the needs of our public library system. 1. What can be done to maximize the role and contribution of libraries to the well-being of all Manitobans? 2. How should the cultural policy address the challenges currently impacting the public library system? 3. How can libraries play a role in celebrating and promoting culture in your community? Indigenous peoples in Manitoba represent a number of distinct identities, cultures, languages and traditions, including Cree, Ojibway, Oji-Cree, Dakota, Dene, Inuit and Métis. Indigenous arts and culture is intertwined to their societies, informing how Indigenous people see the world and interact with others. Please share your views on how Indigenous culture should be reflected in Manitoba's overall cultural policy. 1. How can the cultural policy help reflect the Government of Manitoba's response to the Truth and Reconciliation Commission's Calls to Action? How can cultural policy and cultural activities help facilitate Reconciliation? What is the role of Indigenous cultural development in the Cultural Policy? 2. What can be done to foster the development and growth of Indigenous artists, arts organizations and cultural entrepreneurs? 3. What can be done to foster equitable access for Indigenous people and their communities to community arts activities and arts education? 4. Which government ministries and agencies should play a larger role in cultural development in order to foster a whole of government approach to Indigenous cultural development? Cultural infrastructure refers to physical assets, specifically the buildings and spaces, necessary to support the full spectrum of cultural sector activities. Please share your views on the priorities for Manitoba's cultural infrastructure. 1. What can be done to ensure that cultural spaces engage a broad range of citizens? How can a new cultural policy be used to maximize the role and contribution of cultural spaces to the well-being of all Manitoban communities? 2.	Who needs to be engaged to ensure a long-term strategic approach to culture infrastructure planning?